Ventrilo 是 IP 語音（VoIP）群組通信軟件的下一個演進步驟。 Ventrilo 也是所有其他人衡量其自身特點的行業標準. - The number of changes made to Version 4 are too numerous to mention and would read like a novel. The following is a brief highlight of some of the major changes. - The new default transmit indicator is “Flash User Name”, located in Setup > GUI. It is recommended that Avatars be enabled and User Icons be disabled. - Themes: Multiple Themes are included with the ability to create your own. Re-sizing the window on some themes will reveal additional effects. Additional Themes are available for download from the Themes Library. Some themes may require an increase in the font size or setting the font to "bold" mode. - Multiple Main-Window breakout: Multiple server connections can now be implemented by opening new Main-Windows. - User Profile bind key: Hitting the defined bind key will open a new Main-Window for the User-Name associated with that bind key. NOTE: If the same User-name is associated with multiple servers then the "Description" option in User-name setup needs to have a unique description assigned for every bind key with that name that is created. The description will be displayed in parentheses after the User-name. - Multiple Channel-Window breakout: Individual channels can now be displayed in separate windows. Drag-drop the channel name to the window. - Side Control Panels (SCP): Main window "right-click" options are now available as buttons on either side of the Main and Channel window. Right-click on the SCP to select a view option. - Press and hold the Mute Bar menu button for half a second to automatically open a new SCP window. Menu Button option is enabled in the Setup > GUI tab. - Push-To-Talk button has been added to the Mute bar at the bottom of the window. - Targeted File Transfer: Files can be sent to other Users whether they are online or offline. File options include "Delete after all recipients have downloaded", "save the file in server Memory" (instead of on the server hard drive), and "mark the file as Private". - Avatars: Users can now select, download, or create their own Avatars. 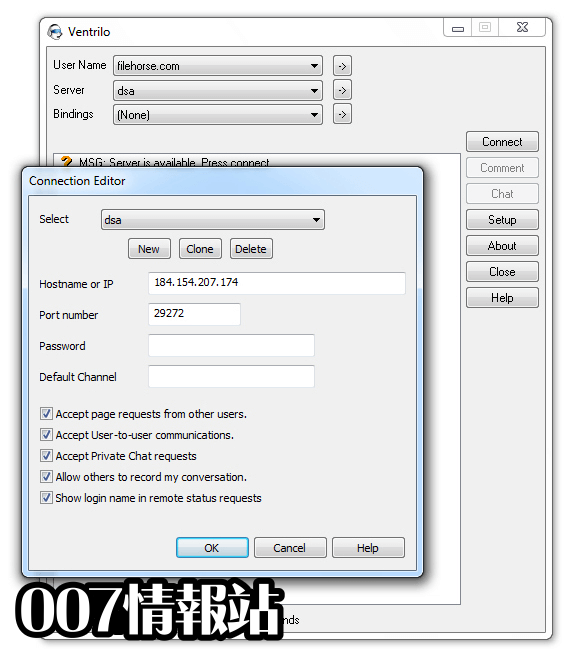 - Registered Users on the server can change their password from the Server setup window. - Display as tree: This option will display sub-channels in an indented view. When unchecked the channels will be displayed in single column left-justified mode. - Deferred Messaging: Messages can be sent to other Users if they are offline.Â They will be notified of pending messages when they next login. - Wireless Headset (bluetooth) support: This option, located in Setup > Devices, will keep the device stream connected after the first audio signal is sent to it. 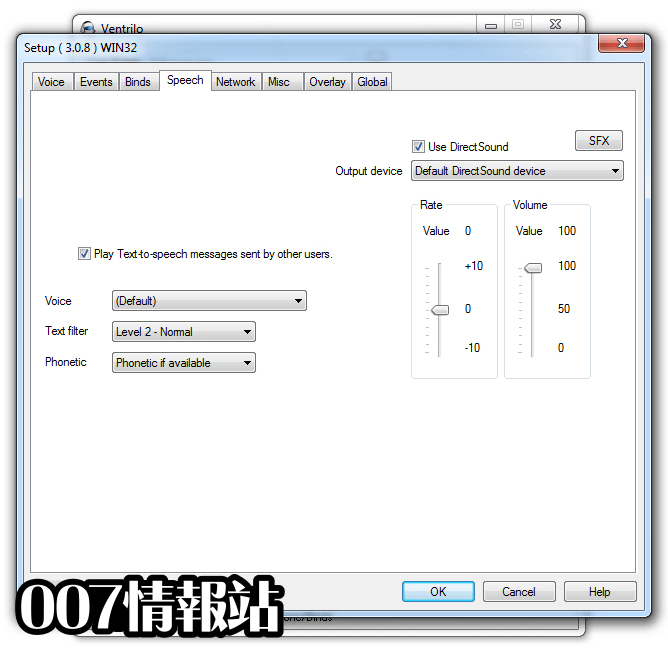 Otherwise, the device will close the connection and it might take up to 2 seconds for the device to re-open and receive the audio. - Channel configuration option to hide the visible transmit indication: This option will not display any indication of Users who are transmitting to other Users that are not in that channel. - Ducking support for voice-activation: Ducking now supports Users with voice-activation enabled. - Theme-based system tray icon (Windows): The icon will flash upon receiving a deferred-message or file-transfer notification when the main window is minimized. - Channel / User comments with a URL included are now displayed as an underlined link. Hover the cursor over the link to display the URL. Control-click the link to send the URL to the default browser. - Application event sounds are now stored in the DocumentsVentriloDataWavAppEvents folder which is always unique to each system login account.Â Each time the program starts it will check this folder for any missing files and install a default version of each file name. If the file already exists it will NOT be refreshed from the program. 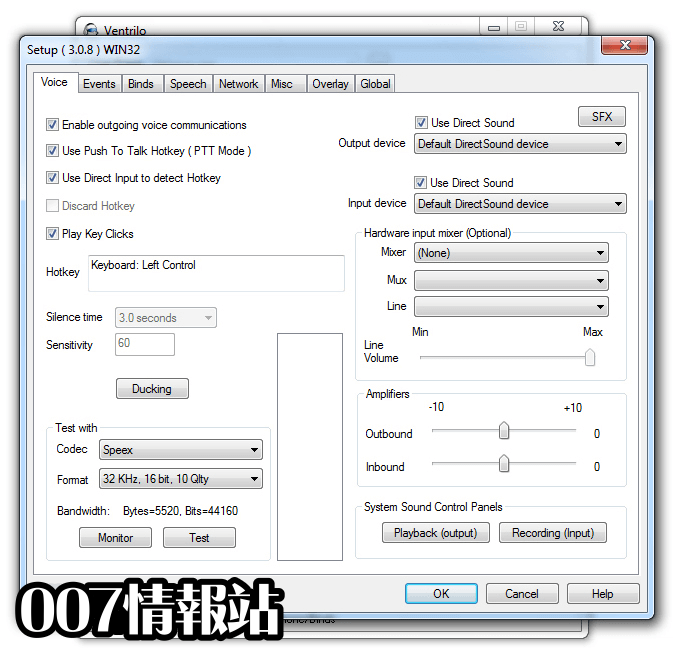 This allows the User to create their own version of each event sound. - Main Window Font attributes: Font attributes (style, size, color, etc.) can be changed for Channel, User, Comment, Integration.Â The font size can be changed temporarily using the key commands listed below. - Admin of Server Admins (Server > User Editor): If checked this account will be logged in as a Super Admin (aka: God Mode). Be careful when giving Users this permission as they will have absolute control of the server including the ability to modify and / or delete the regular Server Admins. - The “Lobby” has been converted to a pseudo-channel. Channel Admin for the Lobby can be assigned to Users which allows Channel Admins to move Users to the Lobby (if the Channel Admin has the "Move users" permission). - Server setup now supports SRV record lookup. See SRV Record Lookup for more information. MAC OSX will have a short delay before populating the IP/Port information while resolving the Hostname before connecting. 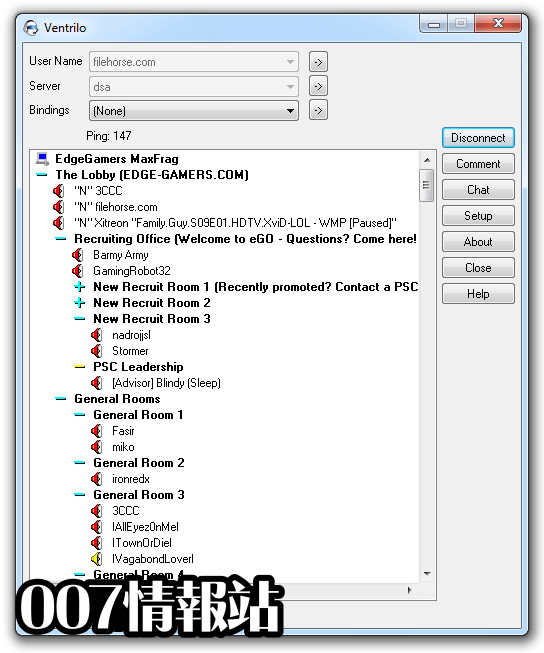 - Main window size / location is now saved for each server name that is selected. 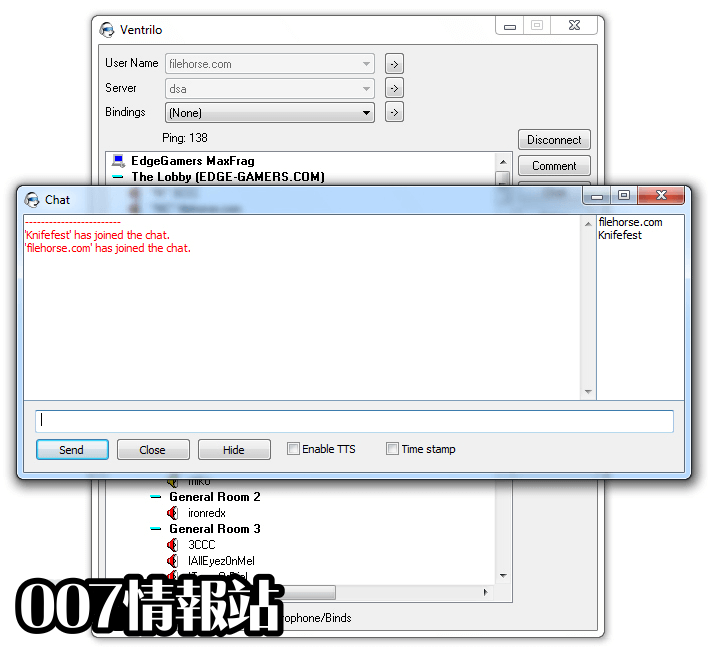 - Chat window character limit has been increased for Global / Private / Deferred Message. Also, 'CTRL + Enter' will issue a CR/LF allowing multiple lines to be entered without performing the "send" function. - Users that are muted will still be recorded when using the "Record" function. Users that are "Globally Muted" will NOT be recorded. - Server Rcon Commands: LOGGREP command has been enhanced. Type "loggrep -?" to display more options. New FX command for "File Transfer" options. Type "fx" to display more options. - Setup will remember the last tab that was viewed for each Main Window since the program was started. - Alt + * (Windows) or Command + * (Mac) - Moves the selection bar to your login name. If performed in a channel window that does not contain your name a bell will sound. - Control + F or F3: Opens a search window to locate any line that contains the specified text. Pressing F3 after performing a search will find the next occurrence. Use Ctrl-F to change search criteria. - Control + Close Window: Holding the control key while clicking the “X” close window icon will restart the associated main window and all of its ancillary windows. This is meant for Theme Designers to reload the currently selected theme after making changes to the graphics or its script. This also has the effect of restarting your connection and resetting everything associated with the selected main window. - Control + C (Windows) or Command + C (Mac): Copies the comment and integration part of the selected name to the clipboard. - Control + U (Windows) or Command + U (Mac): Copies the URL part of a comment of the selected name to the clipboard. - Control + Mouse wheel: Holding the control key in these windows and scrolling the mouse wheel up or down will increase or decrease the font of the tree part of the window. This change is temporary and will be discarded if you restart the window. - Control + Down Arrow: Decreases the font size of the tree. The change is temporary and will be discarded when you restart the window. - Control + Up Arrow: Increases the font size of the tree. The change is temporary and will be discarded when you restart the window. - Control + Shift + Left-Mouse: Moves the Main/Channel window if the title bar has been removed. Alt+F4 to close window.